Big on value; useful V6 tech, but dull dynamics blunt Accord's challenge. If it wasn't for the remarkable strength of the competition - including two other Hondas - the eighth-generation Accord may well have gone all the way through to the final stage. It was COTY 2008's great surprise. Larger than Toyota's Aurion, the now genuinely Falcodore-sized, Thai-built sedan offers unsurpassed value in the class, together with dynamics that are vastly improved over its admittedly underwhelming forebear. Prices are attention grabbing, especially the $29,990 sticker for the cheapest VTi four-cylinder auto - no model currently on sale in Oz offers more car for the dollar - but the $46,990 V6 Luxury also scores highly against the Value criterion. "Outstanding value equation," noted Poppitt. "Heaps of standard kit." The oversized dimensions translate to an impressively spacious interior and a huge boot with a full-size, steel-rimmed spare as standard. Front or rear there is space to spare in every direction, while ingress and egress is easy. However, a number of judges complained of an excess of lower lumbar support. In terms of overall theme and positioning of instruments and controls, the dashboard resembles that of the new Accord Euro, though close examination reveals they are different designs with virtually nothing in common. Initially, the judges complained of an excess of centre-stack buttons, but, as the COTY process unfolded and wheel time increased, many praised the basic ergonomics of the controls. Most significantly, both are beautifully built, with the expected Honda fit and finish. Technology? Both the 202kW 3.5-litre V6 and the 133kW 2.4-litre four pack impressive engine tech as standard. Honda's Variable Cylinder Management disables the rear bank of three cylinders to run as a triple, or one cylinder from each bank to operate as a V4. Testing proved the official 10L/100km isn't a true reflection of the V6's parsimonious abilities on a steady throttle. On the VTi, the engine can operate just one or both of each cylinder's exhaust valves to reduce pollutants. Ignoring the V6's 'eco' light, the driver is never aware of the changeover point with either engine; drivetrain refinement remains a taken-for-granted Honda advantage. For Efficiency and Environment, both scored well. Understandably, the V6 also scored for its added smoothness, more immediate throttle response and swifter acceleration. Amazing how torque-steer is no longer an issue on the best of today's large front-wheel-drive cars. Why, then, did this Honda not progress farther? Certainly not for any lack of ease of driving. Few cars are as undemanding to wheel down the freeway or to park. But true to its American influence, the Accord takes this philosophy a step too far. The utterly feel-less steering is vague, even numb, around the straight-ahead. Perhaps this disconnection between driver and road suits the character of the car, especially on the VTi's 60-series rubber, but the judges expected greater involvement and improved responses. Still, scribbled Poppitt, it is "Dynamically, a quantum leap from the soggy previous-gen."
On track and road, most judges preferred the slower VTi to the V6. A floaty ride and slower steering reactions, blunted by the nose-heavy V6, meant it was slower to turn in, induced greater understeer and displayed more bodyroll. Rapid steering inputs through the lane-change manoeuvre overwhelmed the steering's power assistance, which 'froze' on some testers. Likewise the lower profile 17-inch tyres impacted on ride comfort, especially at low and medium speeds. "Too bouncy and harsh," according to Newton. The brakes were next up for criticism. Complaints about long stopping distances in the wet surfaced. 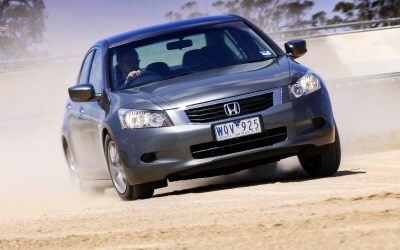 The Accord's standard stability system (labelled VSA by Honda) provoked discord among the judges. Some found it performed poorly on dirt, while others rated it highly for the fact that it was not so intrusive as to prevent effective steering inputs. Disconnect the stability system and, Newton summarised, it was "graceful and predictable". Finally, the team struggled with the conservative styling that manages to borrow many of the worst themes from its Asian competitors. "A bit Hyundai Grandeur in appearance," according to Bulmer. It says plenty for the huge step Honda has taken with the overall abilities of the new Accord that it went through to the second round of COTY 2008. It was then, on the road, that the judges quickly realised the superior dynamics and driver appeal of its in-house Euro rival better satisfied the Car of the Year standards.